The Italian Store rocks! I have yet to try the pizza there, but your review adds to the positive comments I've heard already. What I did have was the hoagies. These ain't no subs, they are real, honest to goodness, gosh I miss Philly hoagies. Very, very worthy. They get very busy so I'd also add that if your going for the hoagie, take a number AS soon as you walk in. The line seems formidable, but those guys sure work fast. Now.......where to find a cheesesteak! I've given up on trying to find a good Philly cheesesteak around here. It just doesn't exist. Most of the people in line at The Italian Store were actually waiting for hoagie orders. So I imagine they are worth the wait. I just moved to this store's neighborhood... now I'll have to check it out! Thanks for the heads up, Jason. Italian Store pizza comes in a close second to 2 Amys; great crust, superlative toppings (esp. the prosciutto), and no 45-minute wait just to sit down. So call 1/2 hour ahead, swan past the hoagie crowd, and smile at the nice lady behind the register with her platinum blonde behive and bright blue glasses with sequins. And leave a tip because those guys really hustle. I was wondering if you knew of any awesome italian pastry shops or places that have awesome canolis? Thanks! For great italian pastries, especially cannolis, go to Vaccaros. The original is in Baltimore's Little Italy, but they have other stores in the area including a stand in the Union Station food court at the end near the entrance to the Metro. If you want a monster dessert, try the $5 eclair it is HUGE and delicious. Personlly, I'm not a cannoli fan, so I'm not an expert on where to get good ones. Hey, just a tip: If you like the Italian Store, you should check out Litteri's in the DC wholesale market (6th and Morse NE). Nothing against The I.S., but Litteri is less expensive and has more stuff. They have very good sandwiches too. I'm not a sandwich nut, so can't say how they compare to other places, but I look forward to having one when I'm there. Litteri has a really good price/selection on wine, deli meats, pasta, and antipasti. Hours aren't very convenient, though. Your blog's a great resource! Thanks. I would love to love the Italian store, but I just haven't had good experiences. The cold-cut subs look great but, to me, are oddly flavorless. For me, Italia in Silver Spring and Mangialardo's on the Hill are the area's great sub makers. The pizza didn't do anything for me either, I'm afraid. I don't know how else to say it Bill. You're wrong. I grew up in Central PA, and miss the hoagie. The italian store takes me home. You are so right -- Italian Store is very strong. My girlfriend and I think about the "Capri" sub every time we drive by. Thanks for the heads up on the pizza. i know clarendon is the cloest metro stop, but is it walkable from the metro, or do you need a car? It's walkable from Clarendon, but it's long, down Kirkwood Parkway. I would recommend driving. It's also just off the Custis trail - what a great stop to take me back to my hometown of Philly after a bike ride! As for the cheesesteaks, Philly Cheesesteak Factory in GTown (on M) makes pretty good cheesesteaks, complete with Amoroso bread. Well, my husband and I went there yesterday to stock up on some frozen cannelloni (sp?) but alas they were out 'til Tuesday. We did take a ticket as soon as we walked in, in case we wanted a hoagie (of course we did, don't be silly). Number 32 and the light said number 17. So, we got one slice of plain cheese pizza to enjoy while we waited. Holy New York pizza, Batman, this IS the real deal. Just opening the triangular box made me happy. It was cheesy, thin and glistened with grease. We were transported home. No sooner were we almost through sharing the slice (we were outside at one of the tables, husband looking in attentively at the ever changing deli numbers) when our number came up for a hoagie. We drove to the mall, grabbed a bench by the WWII Memorial and delighted in the meaty treasure. Then walked off about a fifth of it back to the car!!! Definitely go for the pizza. I'm so glad you gave a shout out to New Haven pizza...it's some of the best in the world. Good to know you can find something similar in the DC area too! It is a little known fact that the Italian Store also sells canolis in two sizes - small and large. They come in regular and chocolate flavors and are filled upon request. They are very fresh and if you are from the Hartford area of CT are as close as Mozzicato's as you will get. You take a number and ask at the counter for the canolis. I have the Italian Store on speed dial in my cell phone. Just one thing, the Italian store guys are from Philadelphia. 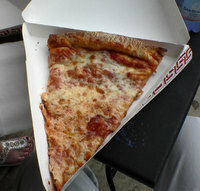 As a Philly girl, I feel that I need to give props to our excellent slices. Another good place: Pumpernickel's on Connecticut Ave in the Friendship heights/Chevy Chase DC 'hood. They have some mean bagels as well. Another great place for slices is Palisades Pizzaria on MacArthur Blvd in Palisades. They DO NOT deliver, but belive me, it's well worth the drive. Try their mac and cheese too...it's excellent. Just a quick follow-up to the comment about Litteri's in NE DC. This is the ONLY place I've ever been, including delis in NYC and northern New Jersey, that offers fresh (wet) mozarella as a basic option on deli sandwiches - no extra charge. To me, this is the epitome of great Italian sandwich making. Don't get me wrong, I have a great deal of respect for the Italian Store. But Litteri's is the real deal version of the kind of place the Italian Store aspires to be - a true warehouse-front store stocked to the rafters with olive oils, Italian wines, de Cecco pastas, and good crusty bread. Their deli meats are excellent, too. Ok - i agree that Italian Store is nice - but those are not the best subs I have had in this area. Italian Gourmet Market in Gaithersburg offers a much better sub. It is very close to the Italian Store - but they use Boar's Head meats and much better peppers. They also have a larger selection of groceries and wine. I don't understand why people have not found out about that place yet. re:district: "Litteri's makes the Italian Store look like the Olive Garden." Too strong, man, much too strong. Credibility takes a drop when this much overstatement is utilized. Litteri's is good; so is the IS; you like Litteri's better, they are your local, so okay. Their selection of wines, italian grocery products, etc., really do not outstrip the IS by much, if at all, and you can get deCeccos at Litteri's, the IS, Vace, Whole Foods, the Giant on Park road, and frickin' amazon.com. Big deal. And I live in DC, and Litteri's is MUCH closer to me. And I still cross the river to get that Capri on that good crusty bread. The Italian store is good, there's no doubt. The problem, or at least mine, is that as soon as you even think about arriving, you must have at least 30 minutes of your life to spare. After numerous trips here, my friends and I have decided that our $7.50 lunch meat sandwich is simply not worth the trip anymore. I've had just about everything up on the board, but the consensus has concluded that although it might be good, it's far from 'the best' (it's in Arlington, not Venice people), is certainly over priced, the line is excruciatingly long, and the sandwich you're about to enjoy is simply not worth the stress on your nerves! Check out the picture of Sandra Bullock behind the cash register that serves as a distraction while you pay too much for deli meat, or maybe even the small Italian style grocery selection - just don't do it when you need to be ANYWHERE soon!!! Suggestion: order more, visit less. Order your sandwiches but get the hots (or other wet items on the side). I find their peppers are appropriately spicy for lunch at work. BTW, $7.50 is NOT overpriced for what you get at the IS. You're paying the same price for a better sandwich at the IS. Compare cost and quality of the meats used (capri fan also): Prosciutto/Capicola/Mortedella/genoa vs Genoa/Pepperoni/deli ham at the NOVA/DC deli that cost the same. I have never had I.S. pizza. I always mean to but the second I walk in and smell the meat I have to get a cold cut. I normally get the Napoli with everything. It is highly recommeneded by me. If you think it is pricey get the large sandwhich, I can normally only eat one half so I take the other for lunch the next day. I just can't go in this place without coming out with frozen dishes too, they are wonderful and so quick on hectic weeknights. Also just a note they sometimes have girl scout cookies too, so if you get a craving and don't know any girl scouts (I eat their canoli save the cookies for later). Plus I live close and don't have to go to NE like Litteri's (sp) which I have never been but heard it is good. Plus the people here are great people they are so nice. 1. On G between 13 and 14, a little past Ceiba--decent pizza! Smells authentic in that place, too. If you want pizza and you work downtown, it works well. 2. Brooklyn Bagel makes pizza during the weekdays. Best bagels in town, so the pizza should be good. But who is near Courthouse on a weekday? Try this at any of the above listed Italian markets. Buy 1/2 bl of Mortadella, Imported Provolona ( I said imported), Calabrasi, a loaf of bread, some Giata olives. Go home and put it all together.